Since 2001, 4Site Interactive Studios has been providing creative digital services to the non-profit and small business community in Washington, DC. All told, our team has brought hundreds of organizations online with new websites and provided them with ongoing strategy, support, and content creation services. As Project Manager, I make sure 4Site’s work gets accomplished on time and on budget. I use Redbooth to manage all of the tasks of the project lifecycle, from project setup to content strategy and design, to development, then training, and finally launch. And I even use it for post-launch support. 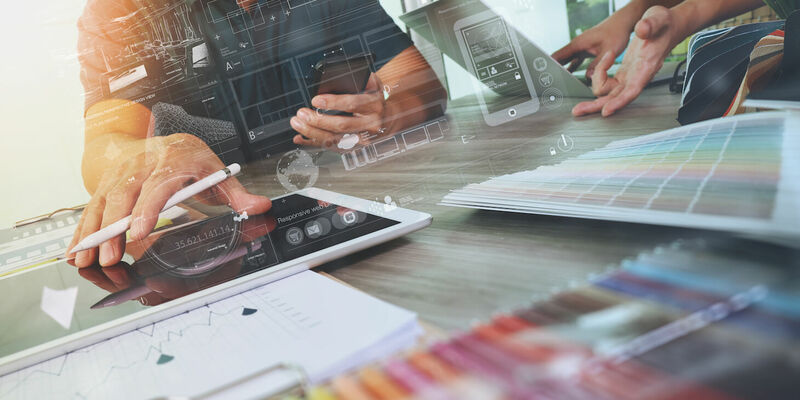 If you’re part of a creative agency, you know that ensuring a project’s success is about more than just having a good team of designers and programmers, it’s also about managing the work efficiently to keep a project on time and in scope. This is true whether it’s a simple project, or one with multiple moving parts, critical paths and stakeholders. Task management can mean the difference between a project that is profitable, or one that goes in the red. So no matter the size of the project, we do two things: 1) we always try to keep things as simple as possible, and 2) we use Redbooth to manage our work. Every good project starts with a kick-off meeting to scope out the requirements and to establish the client’s wants, interests, needs, and trust. Prior to that meeting, we create a shared Google Doc and send it to the client so they can start to focus on defining those requirements at a high, basic level. While the things that get said in a meeting sound great, what really matters is what we document for our goals, requirements and next steps. If it’s not documented, it’s easy to forget, attribute and overlook. That’s why every meeting we conduct has the meeting minutes documented in Redbooth. 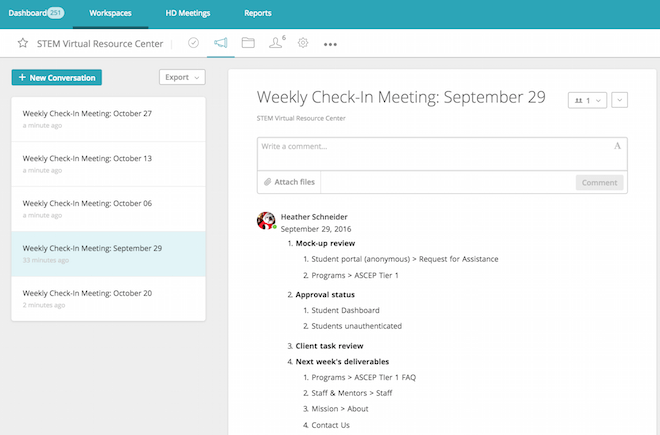 We use Redbooth Conversations to record meeting agendas and update those agendas with the minutes and action items. We then create tasks and assign them to the relevant owner – whether it’s a 4Site staff member or a member of the client team. When we start a project, identifying the client’s key stakeholders and points-of-contact is of utmost importance. Who is the business owner? Who is responsible for technical questions and content questions? Who has the final sign-off on features and functionality? Identifying the right people at the start of the project is critical. These key owners are identified collectively during the kickoff meeting and, with each feature that is built, the completed task is assigned to those people to review, provide feedback, and approve. I love Redbooth – mainly because I love projects that are organized. Redbooth provides complete transparency for our clients, offering an instant view of project status, down to the task level. We want our clients to feel comfortable logging into Redbooth to review items, ask questions and provide us with information and feedback. 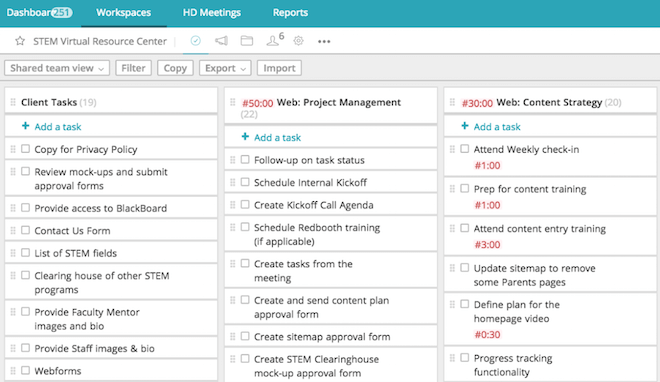 Redbooth is made up of sections that offer useful features to manage a project successfully. Three that we rely on are workspaces, tasks and conversations. The workspace is the heart of the project, where every individual task is listed, along with who is assigned and its due date. We create standard “task lists” to make each phase of the project easy to understand. In our case, we divide the tasks up according to the type of work, including Strategy, Design, Development, Theming, Project Management, and Client Tasks. Here is a look at part of one of our project workspaces. 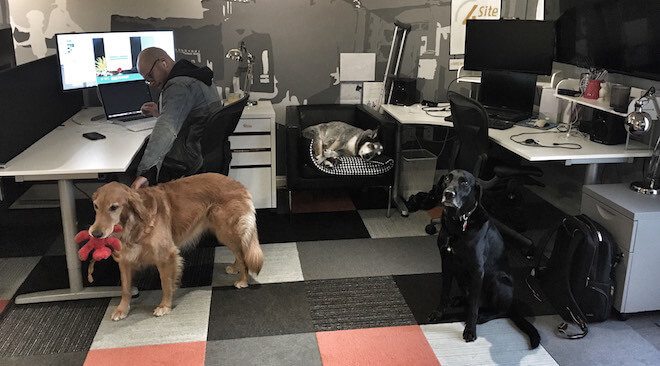 You can see that there are 6 people who can contribute to the workspace (this includes team members and clients). In this workspace, we have 13 active task lists (3 are seen here). Each of these lists contains tasks that we assign to specific people with due dates. What’s great about this setup is that it allows us to see the entire scope of the project from start to finish. We also have a place to record, track, and communicate about all activities related to the project. Redbooth recently added some new features to tasks to make them more powerful. You can now assign multiple owners to a task, and you can assign subtasks to different people and with different due dates. Another feature I frequently use is the ability to create a recurring daily task. I use this to set reminders for myself to review the project status, ensuring that I don’t miss any of my projects’ deliverables and that I keep the team’s momentum moving forward. To streamline the project setup, we use saved task lists for our standard project account management activities and deliverables. In each workspace, you can create conversations on specific topics. Conversations are good places to discuss the project as a whole, or items not specifically related to a task. Conversations are a good replacement for group emails, and ensure all discussions are tracked and remain within Redbooth. Keeping it simple from a process standpoint is what helps us tackle exciting projects and stay focused on the work itself. From start to finish, Redbooth helps us execute successful projects. It provides our clients with a transparent view into our process and helps us maintain an efficient, collaborative workflow between our clients and the 4Site team. As 4Site’s Sr. VP of Operations, I run our Web projects and help run our business. I manage a team of highly talented designers and developers from our office in the Columbia Heights neighborhood of Washington, DC. My background is in online search, with 19 years experience in management, consulting, product development and knowledge engineering.